The Majestic Diner is a modern dining experience located on the southbound side of Route 17 in Ramsey, NJ serving expertly crafted classic dishes. Our doors open early and our food is available for take-out, delivery, and even catering! We also have a party room, perfect for special occasions or corporate meetings. Come by for a fresh cup of specialty coffee from Ninth Street Espresso, a fresh baked goody from our in-house bakery, delicious thin crust pizza made to order in our brick oven, or one of our other crave-worthy dishes. Designed with comfort and sophistication in mind, the Majestic Diner is perfect for everyday dining. Sourced with the utmost care, and roasted exclusively for Majestic Diner. In 2001, on the Lower East Side of Manhattan, Ninth Street Espresso [NSE] established the city’s first quality-driven, specialty coffee bar. The idea was to serve the highest quality coffee, plain and simple. "At NSE, the commitment to quality and craftsmanship is striving always towards one thing: great coffee, brewed with care, for everyone." "Daterra is famous for producing some of Brazil's finest coffee. From it's immaculate and innovative processing methods, to its commitment to sustainability and the environment, Daterra is synonymous with quality." Brazil, Boa Vista Farms, Grown at 1,150m Elevation. Catuai varietal, Natural and Pulped Natural process, with notes of dark chocolate, sweet macadamia, butter, and a full bodied taste. "For over a century our friends at Fincas Mierisch have been producing quality coffee in Nicaragua and Honduras. There decaf offering is water processed and have not come in contact with any chemicals." Honduras, Cerro Azul Farms, Grown at 1,450-1,700m Elevation. Caturra and Red Catuai varietal, Washed and 10% Pulped Natural process, Decaffeination process using only water. For those who have Celiac disease, you can rest assure, because we use Cup 4 Cup Premium Gluten-Free Flour Blend exclusively for our delicious treats. Cup4Cup is a complete multi purpose, gluten-free flour blend that successfully replaces all-purpose wheat flour in our recipes. Cup4Cup was developed by professional chefs and was specially formulated for texture, taste and performance. It’s gluten-free, but you might never have known it. We also offer Paleo treats! The Paleo diet is the healthiest way you can eat. Our modern diet is full of refined foods, trans fats and sugars, which is the root of degenerative diseases such as obesity, cancer, diabetes, heart disease, Parkinson’s, Alzheimer’s, depression, and infertility. Typical items excluded from the Paleo Diet are dairy products, grains, legumes, processed oils, refined sugar, salt, and alcohol. The diet mainly consists of eating plenty of, fruits, vegetable and natural meats, and drinking lots of water. Look for some of these sweets to make it to your next party? 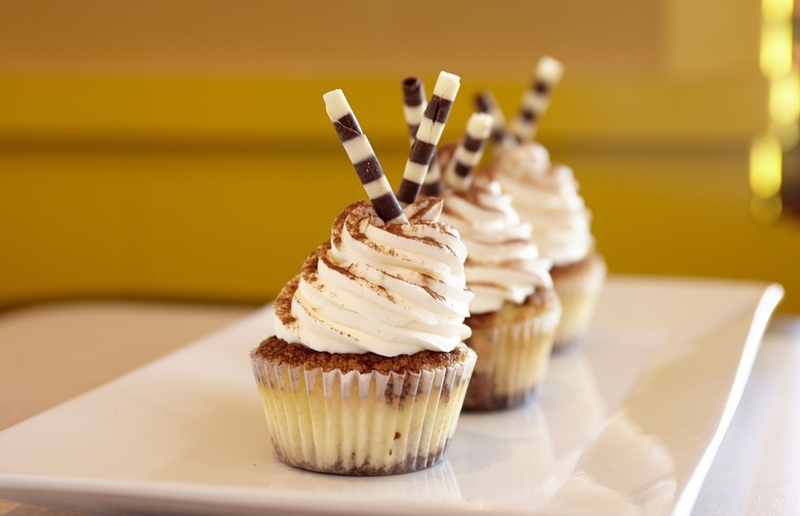 Our lovely pastry chef makes beautiful treats to satisfy any party craving! Feel free to ask your server for our Dessert Catering Menu, or email our Pastry Chef Naomi at naomi.eatmajestic@gmail.com, or call 201-962-8750 for custom orders. A little about our extraordinary Pastry Chef, Naomi Moschitta: Born in Japan, she attended Le Cordon Bleu in Paris where she began her training in the pastry arts. She’s previously worked at the Greenwich Water Club in Connecticut, Indigo Smoke and Bibi’s Restaurant in NJ. She’s a highly regarded chef who can memorize her recipes by heart, and can make most treats gluten-free taste absolutely amazing! Menus are subject to availability and may change, please visit the Diner for the most up to date menu. Three eggs, choice of home fries or grits, with toast. A split banana, and your choice of three kinds of ice cream. Then have it topped with strawberries, fudge, whipped cream and cherries. House-made Vanilla Bean and Chocolate Chip scones. 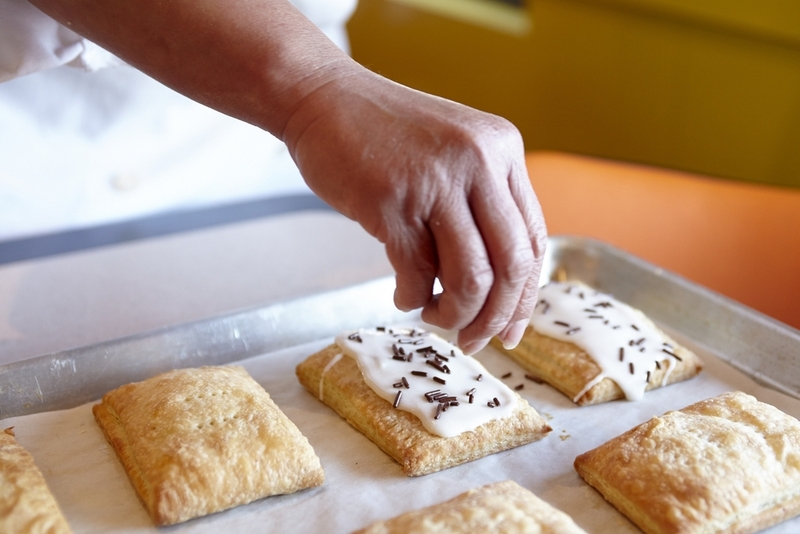 Enjoy our house-made pop tarts, filled with delicious goodness and then topped with sprinkles. Try our house-made BIG chocolate chip cookie with a glass of ice cold milk, before, after or during your meal. Try one of many desserts made by our in house Pastry Chef, Naomi. 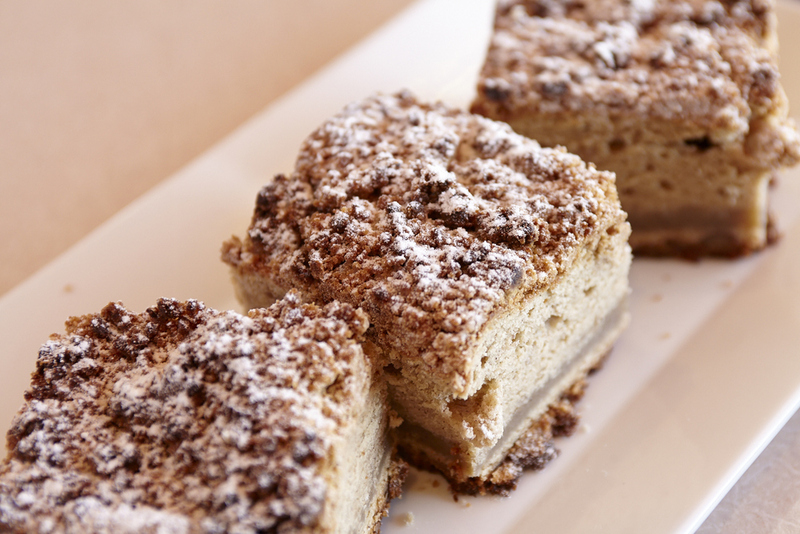 We can cater and make many of our desserts gluten-free. Try any of our lovely cakes today! We know they're pretty, but they taste pretty amazing.